last weekend we returned from a 3 week road trip through a couple of southern US states. now we are back with simona and her husband, enjoying some more family time together for another 3 weeks. on our round trip there was lots of car knitting and we also stayed in a cabin with no internet which meant no distractions and plenty of time for knitting and reading. i finished Attachments by Rainbow Rowell and loved it. i really like the way she develops characters. only one more book of hers to go (Landline) and then i will have read all of her books. i can't wait for her to publish a new one! after Attachments i read a book that popped up in my recommendations list called A Little Something Different, by Sandy Hall. it was sweet but i didn't find the characters as likable as the ones in Rainbow Rowells books. the storyline and the interesting point of views used in the book were quite intriguing though so it was an enjoyable read. sitting on the beach i started listening to an audiobook, the classic "Adventures of Huckleberry Finn", read by Elijah Wood. his reading/performing is superb and i am utterly enjoying it - it is awesome! i have now started Crocodile on the Sandbank, an Amelia Peabody murder mystery, by Elizabeth Peters. it was actually recommended to me by a reader through a yarn along post when i asked for reading recommendations just before our trip. i'm only 2% into the book though so there is not much i can say about it now. knitting-wise i have finished/ cast off and i am currently blocking my Louise cardigan by Carrie Bostick Hoge (those of you following us on instagram have been able to witness its progress). it has been a quick knit and i am now waiting for some bamboo buttons to arrive to finish it off! i will share as soon as it is done! now it's back to my steamy (The Age of Brass and Steam kerchief) which I'm planning to finish while we are here and then give to Simona as a gift before we leave. 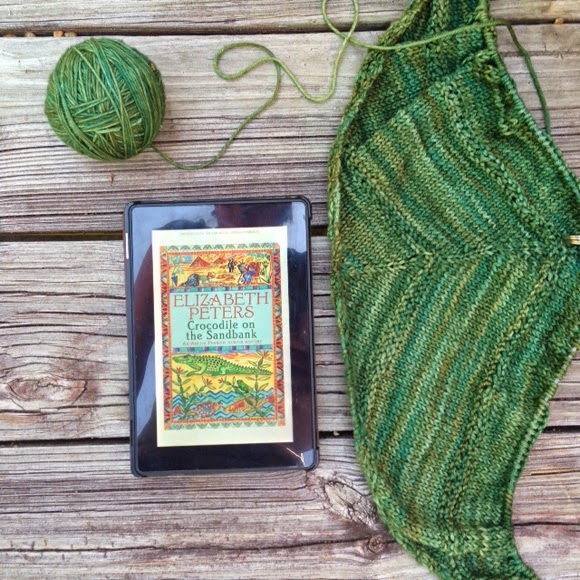 so tell me, what are you knitting and reading at the moment? looking forward to reading your posts! Gosh that green is beautiful. what a wonderful vacation! I love the color of your shawl....it's such a beautiful shade of green! It sounds like you both are having a wonderful time being together, I'm so glad. I love sitting on the beach, reading or listening to a book and knitting, it's the best. Have a great time you two.! Wow, that is a lovely green. :) I'm such a sucker for a little variegation lately. What a beautiful and fresh green colorway. I love road trips. And being in a secluded cabin sounds heavenly for this knitter and reader! Found the Age of Brass and Steam! I love the greens of the yarn you used and now I must make a conscious effort not to cast one on today as there are too many WIPs at the moment!